When I think od Bengal gram dal/Chana dal the first thing that strikes to me is the favorite sweet poli which is a popular indian sweet flat paratha which is prepared for either “Holi” or “Ugadi”. Chana dal/bengal gram dal is used in the preparation of the payasam, (called Madgane in konkani) poli, panchakajjaya , chana dal sweet kichadi and also the spicy fried dal etc and many other dishes. ( these dishes one can find on this blog) This recipe i happen to try a couple of times at home and so thought of sharing with the viewers of my blog today. Here it is…. 1. Wash, peal and chop onions, cilantro fine, grate ginger, green chili and keep it aside. Good to remember: 1. 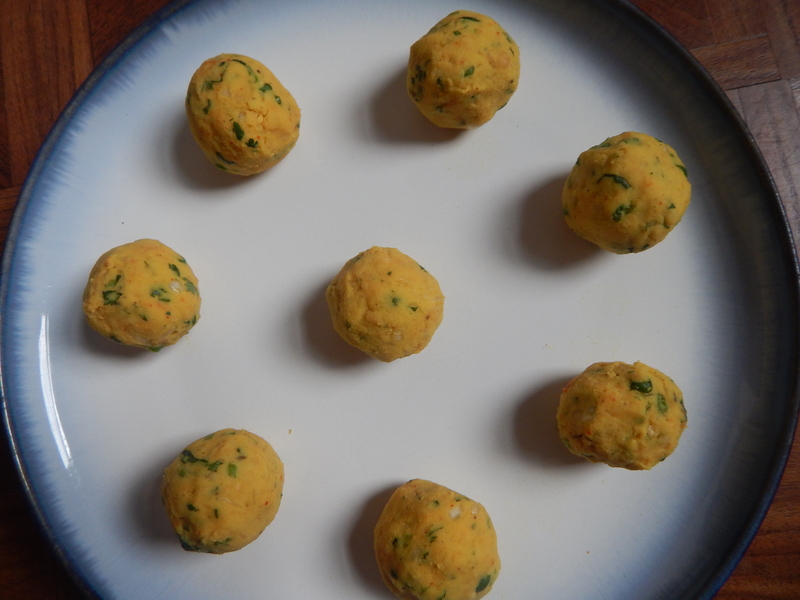 Chana dal should be cooked soft to make a proper stuffing. 2. One can even add any masala powder or even add ginger-garlic paste etc. it is one’s option. 3. 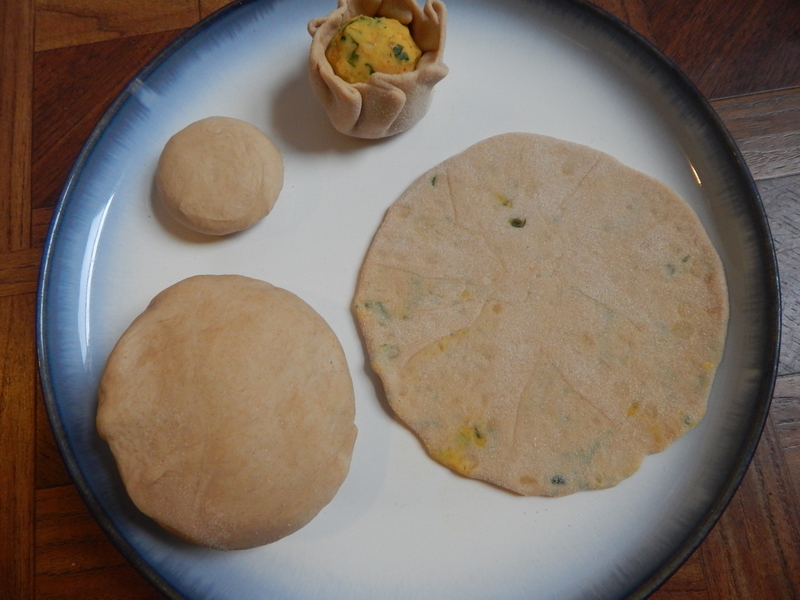 Make the outer dough soft enough so that one is able to get a proper binding to the stuffing too and is able to roll easily so that it does not ooz out and make the paratha shapeless. This entry was posted in Uncategorized and tagged Bengal gram dal dishes/chana dal dishes, Parathas & Rotis. Bengalgram dal/Chanadal though resembles Toor dal very closely is not as widely used in our daily menu – meals and dinners – as the former. Instead, it finds use in snacks such as sweet chanadal kichadi, crispy fried chanadal, Puran poli, Madgane. Along similar lines, today I would like to put up a sweet dish prepared in combination with chana dal, jaggery, poppy seeds, and pure ghee a prasadam dish for the Varamahalakshmi Pooja on the 16th of this month. 1. Place a skillet with a teaspoon of ghee in it and warm up chana dal for about 10 minutes on simmering the flame till you get a pleasant aroma but of course do not burn it. 2. On cooling add 2 cups or a little more water to it and cook it in the as usual for about 25 minutes till soft. 3. In the mean time grate coconut, peal and powder cardamom, chop jaggery as well fine and keep it aside. 1. Jaggery syrup should be strained to avoid the dirt ( little stones etc.) that often come with jaggery. 2. Make sure the dish is given a constant stir to avoid it from getting burnt. 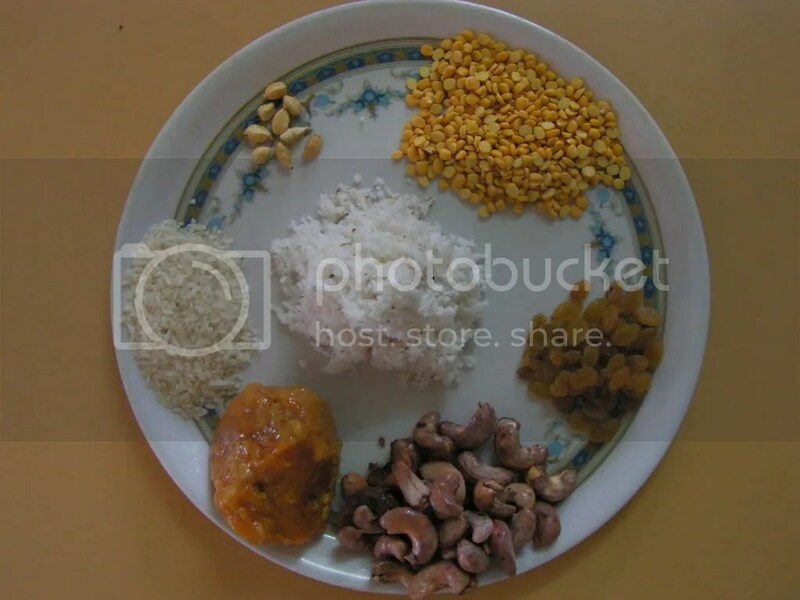 This entry was posted in Uncategorized and tagged Bengal gram dal dishes/chana dal dishes, Bengal gram dal recipes/dishes, Festival food, prasadam. Chana dal (Konkani)/Kadlebele (Kannada )/ Chick peas dal is used in diverse preparations such as the madgane, puran poli, chivda, kosambari to name a few. 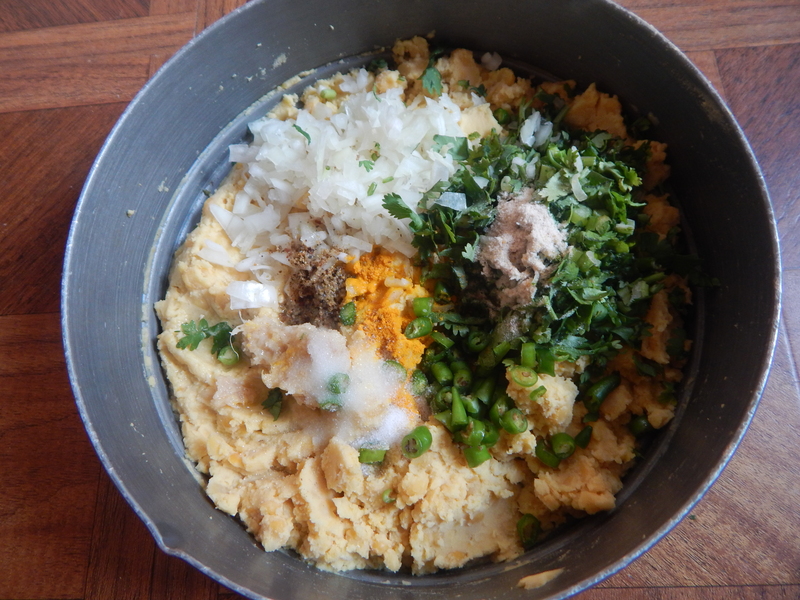 We also prepare panchakajjaya prasad for the Sankashti Puja. Chanedali Kichadi is a popular Konkani dessert, especially these days as a wedding dessert ! 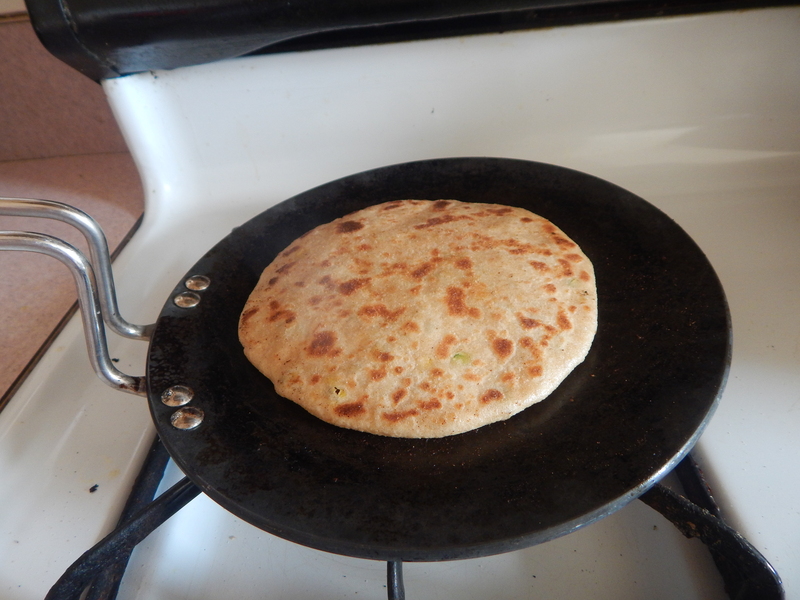 Usually prepared with broken wheat, but some household traditions prescribe wheat sujee/rawa for ease of preparation. Here is my version of the dish. 1. Wash and drain water from broken wheat and keep aside. Grate coconut, peel and powder cardamom keep aside. 2. 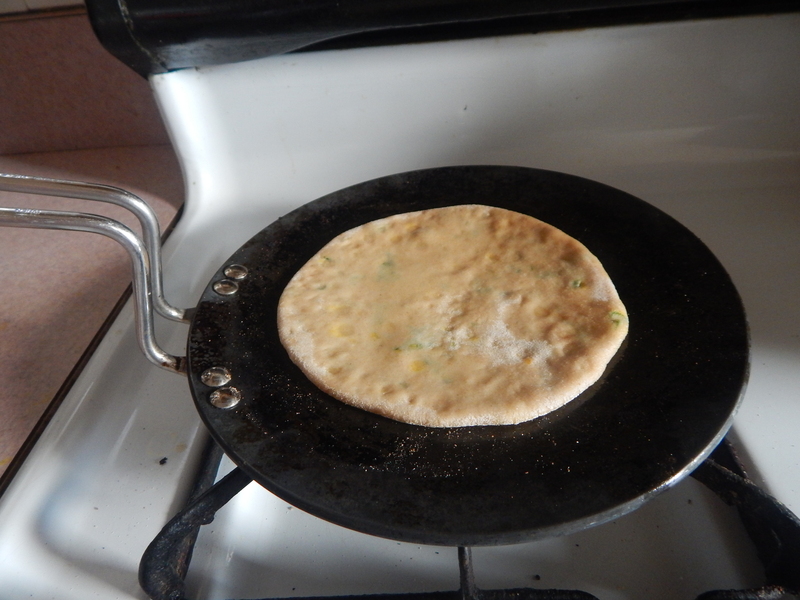 Place the cooker on medium flame with 1 teaspoon of pure ghee in it. When it melts, add broken wheat and warm it for a while till it dries up. Then, add Bengalgram/chana dal and fry for about 2-3 minutes. 4. Add required quantity of sugar and fresh grated coconut and let the mixture cook on low flame. Stir at regular intervals to mix it well and prevent the bottom part from getting burnt. 5. 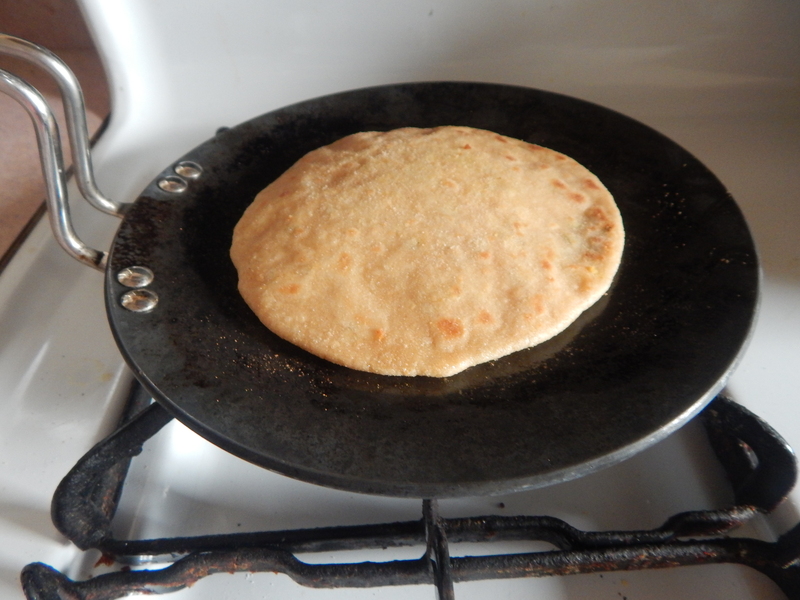 Separately, heat a spatula with 2 teaspoons of pure ghee in it and fry the cashews and raisins. 6. When the khichadi has mixed well with sugar, add the fried cashews and raisins and mix well. Also add cardamom powder from step-1 and let it cook till it solidifies. 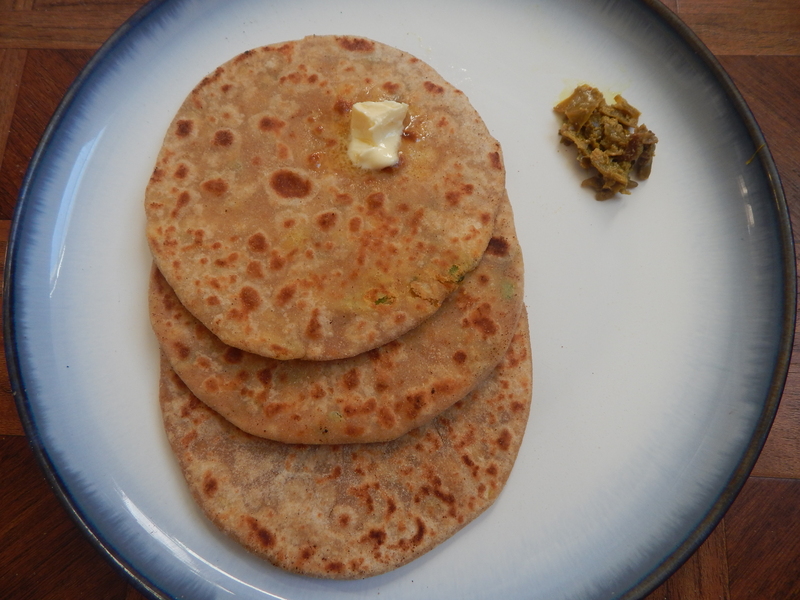 Serve it with a dollop of pure ghee. Enjoy either hot or even lukewarm. Some even prefer it served cooled / chilled. 7. Ready to serve chanedali kichadi is as shown in the image below. 1. Both dal and broken wheat should be warmed up slightly to get rid of the raw smell. Caution – do not fry for too long as they will then not cook. 2. Quantity of water depends upon the quality of broken wheat one uses. 3. Jaggery can also be used in place of sugar. 4. Konkani people enjoy this dish with plain dosa. This entry was posted in Uncategorized and tagged Bengal gram dal dishes/chana dal dishes, Konkani dishes, One hour, One pot meals, Sweets. Dried Dals are legumes and a variety of these are available in India. 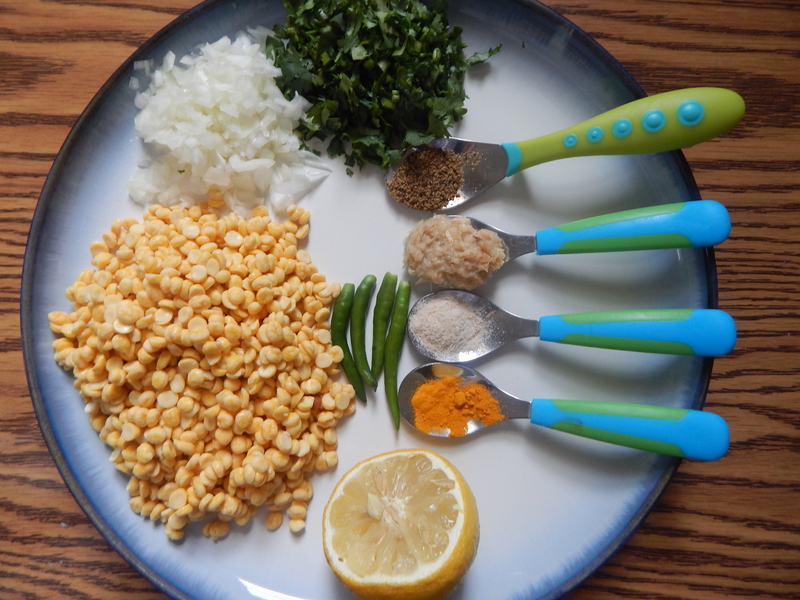 This recipe uses “chana” (pronounced chun-ah) dal – yellow in colour and similar to, but not exactly the same as dried yellow split peas. (White peas dal). Infact the flavor and texture of Chana dal is completely different from the yellow split peas. In Kerala people use more split peas dal than either Toor dal or Bengal Gram dal/Chana dal. Chana dal is used in the preparation of many dishes like the kosambri, the Dal Vada (Chettambade), Panchakajjaya, etc. This dish I am describing here is a sweet pudding made from Chana Dal. Also called Madgane. Its a Ugadi special (never mind that one of the Ugadi is past) and its typically relished as a side-dish for Khotto. It is also prepared in many temples for their anniversery functions etc. Although it is generally popular dish, it is surprising that most modern restaurants do not serve this. 1. Soak rice in water for about 1/2 an hour. Grate coconut and keep it aside. Peal cardamom as well. 2. Place a broad based bowl on medium flame with a teaspoon of ghee and on melting add 2 Tablespoons of Chan dal to it. Roast until you get a pleasant aroma. 3. Transfer roasted dal into the cooker and add 1 cup of water to it and leave it for around 10 minutes. Cook it in the cooker as usual for 25-30 minutes till soft. 4. Crush Molasses (Jaggery) and add some water to it and bring it to boil. While boiling add cashews and cook till done. 5. When cooked add cooked dal from the cooker to this mixture. 6. 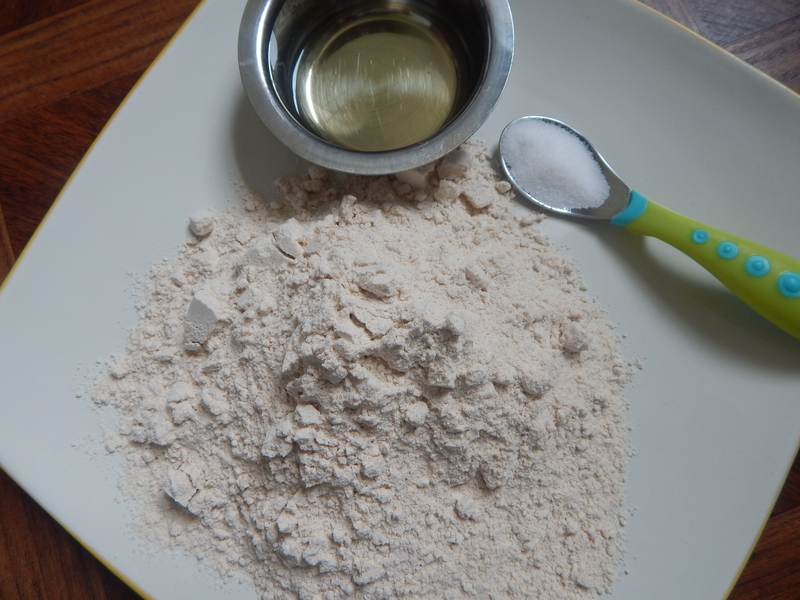 Grind grated coconut, soaked rice and cardamom from step-1 in the mixer adding water in steps to a medium fine consistency. 7. Add ground mixture from step-6 to the cooked jaggery-dal mix from step-5 to it and bring it to boil adding water in steps and stiring continuously, so that it does not catch the bottom and burn the dish. You may need to add water to this but make sure that having added 1 cup of water in Step 3 and a small amount in Step 5, do not add more than 3-4 cups of water in Step 6/7. In other words, the whole dish should not use more than 4-5 cups of water. And the dish is now ready to be served . 1. Roast dal in such a way that it does not change its colour. 2. Keep stirring continuously after adding the ground rice coconut mixture to avoid sticking the bottom. 3. If too little water is used, the dish will turn into a cake in a few hours and lose taste if you try to dilute it later on. Of course, too much water will dilute it straight away ! 4. Regarding Cashews even dry pealed cashews can be used for the dish. During this month tender Cashews are available afresh here so we use it. 5.It can serve as a party dish also if prepared on the previous day and served chill will be more yummy. 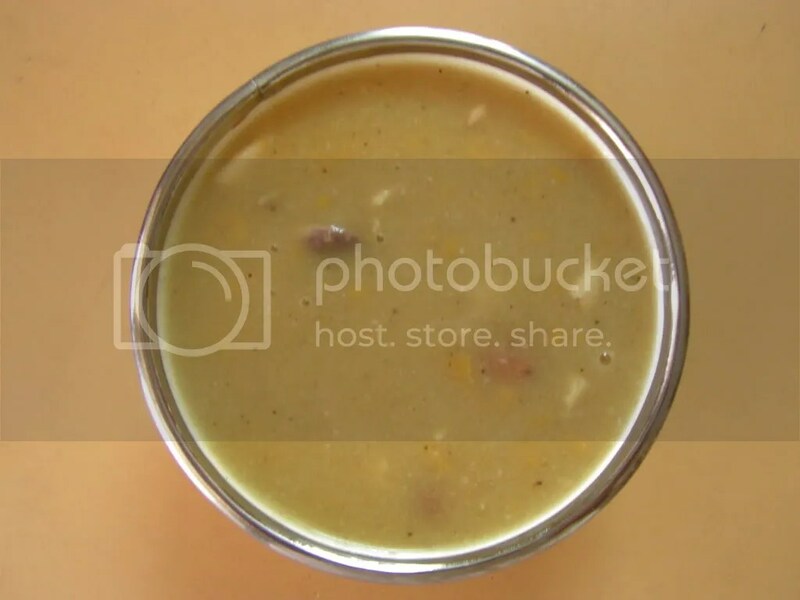 This entry was posted in Uncategorized and tagged Bengal gram dal dishes/chana dal dishes, Festival food, One hour, Sweets.